Purism is the leader in privacy and security focused hardware and software. Our Librem laptop range consists of two customizable 13” and 15” models – featuring an anodized black aluminium chassis, Intel Core i7 processor with Intel HD Graphics, multi-touch trackpad, full-size keyboard, matte IPS display, up to 16GB DDR4 memory and two solid state drives. They are thin, light, fast and power-efficient. Physically turn-off your camera, microphone, Wi-Fi and Bluetooth with our trademark hardware kill switches. Combine a Librem laptop with the Librem Key, and you have the most secure hardware combination on the market. 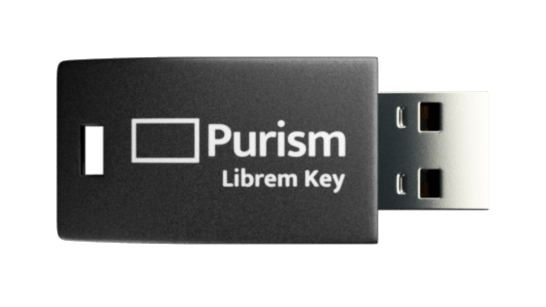 You can use your Librem Key to securely login and lock your system; to encrypt, store and access security keys and passwords; to generate one-time passwords for two factor authentication, and to detect hardware tampering. It doesn’t get safer than this. We safeguard organizations of all sizes against the escalating threat of data breaches and cyber attacks. PureOS is built on top of Debian Linux and follows the leading privacy and security best practices. With PureOS, you get full disk encryption to safeguard your data, the best open source privacy and security-focused software and applications – to browse the web, edit documents, send email, develop software and access virtual and remote machines. Our products are the built on open hardware and open source software and are independently verified and trusted by security experts and software developers around the world. No other company on the market gives you complete control over the entire security process like we do – every aspect of the system can be audited and configured to your needs. Get a free expert security consultation to identify and secure your attack surface, combining secure hardware solutions with private, trustworthy, and verifiable software. We will work with you to understand and assess potential vulnerabilities, protecting your business from the threats most likely to impact it. All our products are protected by the Purism Manufacturer Warranty and we offer a range of customizable Enterprise Support packages to suit your business’s unique needs. With us, you get the best in class, same-day support from the same people who designed, built and use the products everyday.